A Christmas tree is an evergreen tree that is decorated in lights and ornaments during the Christmas holiday season. Presents (gifts) are placed under the Christmas tree and traditionally opened on Christmas Day (December 25th). 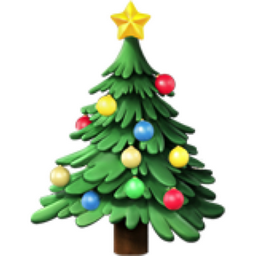 A joyous and merry emoji full of giving, love and holiday cheer. A decorated Christmas tree with an assortment of ornaments.